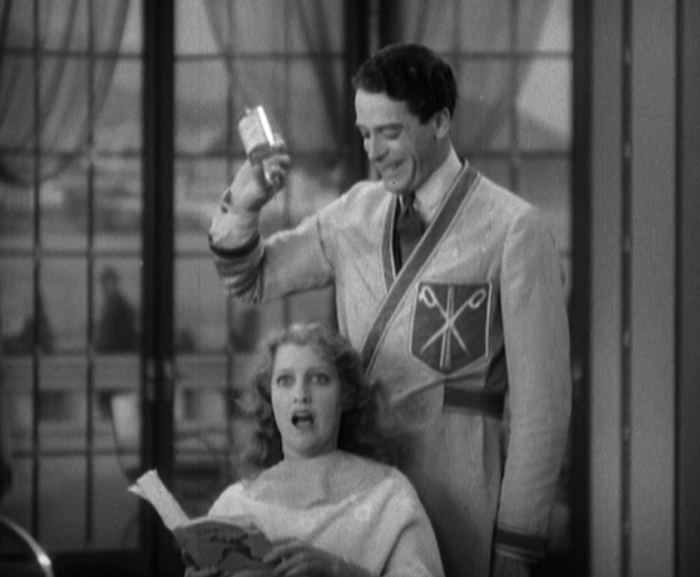 Jeanette MacDonald is probably wearing just a neglige for about 25% of the movie. The Prince Liebenheim’s introductory song assures us that he will teach his future wife the true meaning of obedience. It’s okay, I think she could take him. Homosexual undertones galore. More on that below. 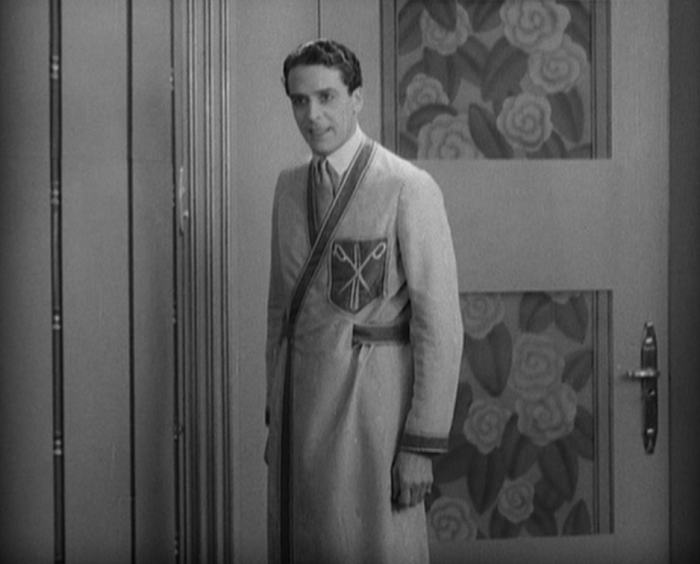 Another great Ernst Lubitsch pre-Code, Monte Carlo is frothier than most, if only because it still shows the great director working on acquiring his ‘talkie’ feet. In a year where most pictures static talkers bend on cramming as much melodrama into a musical as one could reasonably fit, Monte Carlo never flits towards dramatics nor hysterics. It’s a pleasant, warm movie, that shows the director still pushing what that new genre– ‘the musical’– really could do. The plot involves a runaway countess in the form of Helene Mara, a sardonic, playful woman who also happens to be a bit of the snob. The dorky Prince Otto isn’t enough for her (the Prince should probably be wary after the girls laugh as he assures them “my papa tells me I have charms galore!”), so she heads to Monte Carlo to cover her debts and break the bank, something she anticipates doing within a few days of her arrival. Once there, Count Rudolph Farriere, a wispy bachelor with an unmistakeable sense of mischief, decides to court her. He tries to give her luck in the casino, and then he tries a romantic duet over the telephone– she hangs up. Finally, inspired by a chance encounter, he decides to disguise himself as her new hairdresser. His inability to do the job comes second to his ability to get her out of that robe that so enshrouds her. It takes much of the film for the Countess to count Rudy as a human being, let alone a heterosexual. Jeanette MacDonald is great in the movie, making Helene a splendid poor rich girl who lacks self control, much to her own detriment. MacDonald still humanizes a character who is often bratty, and she gets the most out of being able to be both desperate but powerful. 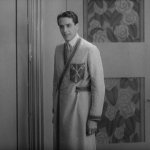 And while Buchanan is no Chevalier (he’s certainly not as butch), his mincing playfulness and utter desperation come across as charming rather than creepy. 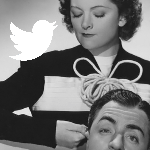 Lubitsch displays his usual visual cleverness. 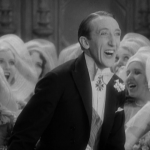 The movie opens with a wedding processional and ceremony across an open courtyard wrecked by rain (which is totally ironic, by the way), that indicates the foppish groom and the missing bride without uttering a word. One of the most notable motifs of the film is preponderance of keys and locks, starting with the film’s opening and up to a scene where Marlene hides key upon key to keep herself from physically giving herself up to Rudolph. 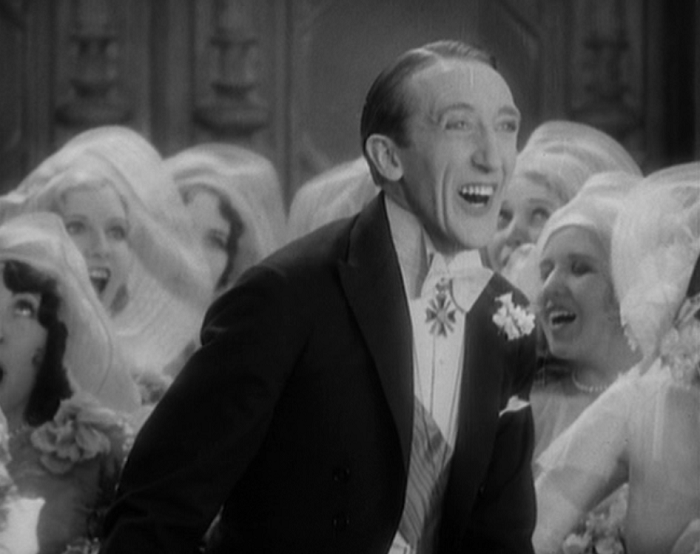 But Lubitsch is more than a visual artist, and he has plenty of fun with sound along the way. MacDonald’s first big number, “Beyond the Blue Horizon”, sees her optimistic song of hope as her train journeys toward Monte Carlo met with a chorus of eager and happy farmers out in the fields, adding a dimension of musicality to the outside world. One memorable bit during the number “Trimming the Women” (which sounds dirtier now than it probably used to be, and even then…) sees the three singers belting out a verse with their mouths full of food. 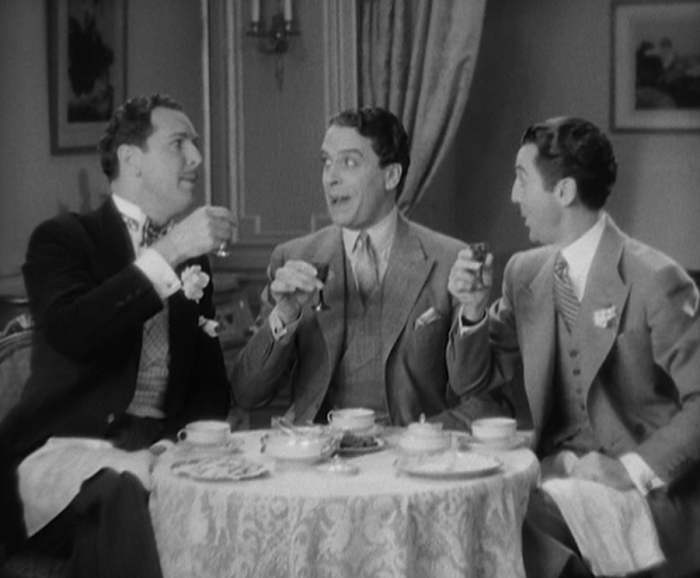 And the film’s climax, set at an opera whose plot mimics that of the film’s, features some delightful pantomime and a wonderful subversion of the musical cliches sweeping the new talkie artform. In case you’re wondering about this (I know you were), it’s considered good luck to rub a hunchback’s hump and grant their request. That’s why they do that in the movie. Apparently MacDonald didn’t share the enthusiasm many film buffs felt for her early groundbreaking musicals. During a screening of Monte Carlo many years later at the Museum of Modern Art, she laughed openly at all the wrong places, so irritating the audience that an usher was sent to quiet her. Goatdog, back in the day, gave this a good review. 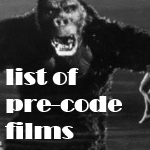 In the list of pre-Code films. This film is available in the Eclipse box set of Lubitsch Musicals. Also included are The Love Parade, The Smiling Lieutenant and One Hour With You. It’s for sale over at Amazon. 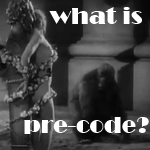 I love my precodes but can’t stand precode musicals. 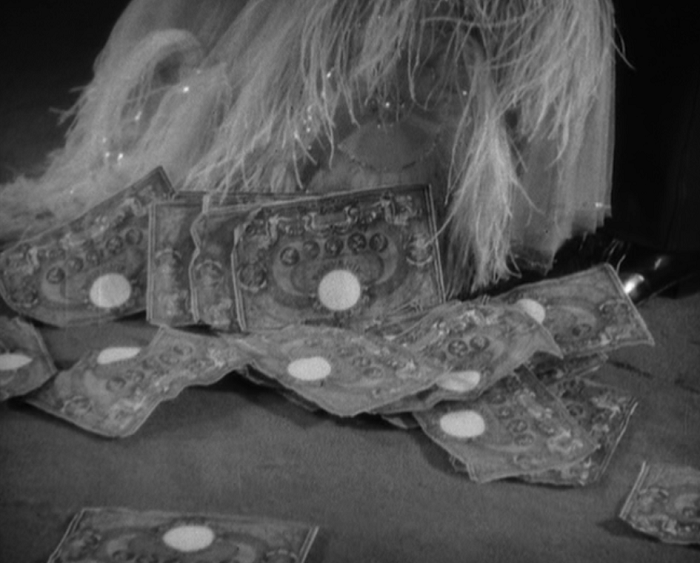 The gold diggers of 1933 is the only one I could stomach. The smiling lieutenant was awful. Keep up the good work on your blog Danny! I always look forward to your emails! You’re breaking my heart, Nancy. But, yeah, if you didn’t like Smiling Lieutenant, stay far from this one, too. Why are no dvds of films made by jeanette macdonald for sale in the UK.